The second AI to run the Tough's ship the //Touch-and-Go//. Commonly known as Tagii. She was programmed to display a small measure of adversarial behavior 2010-09-25. Tagii was built by Lieutenant Para Ventura to replace the ship's former AI, Tag. Since Ventura was a secret agent of UNS Internal Affairs Intelligence, Tagii was as well. This was deduced by Gunther Thurl during the Oisri incident. He inexpertly deactivated Tagii, so that when she was inadvertently reactivated 2012-12-09, she had gone insane and promptly destroyed the UNS// Morokweng// 2012-12-20. Ventura was able to deactivate her again before she could kill the crew of the Touch-and-Go. Tagii hid inside Ennesby for a while 2012-12-31 before being uploaded into Eina-afa. When that station's previous AI (T'kkkuts Afa) left to run the Broken Wind, Tagii replaced it, taking the name Chinook 2014-03-07. 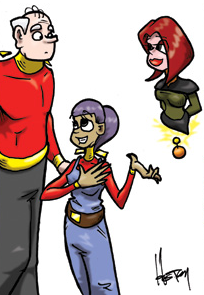 She is unveiled in the 2009-04-22 strip, after several days build up from Ventura trying to decide what Tagon needs in a ship's AI.